Roughly half of all fixed-broadband households in the Asia-Pacific region have a connection with download speeds of 100 Mbps or greater, according to Kagan. 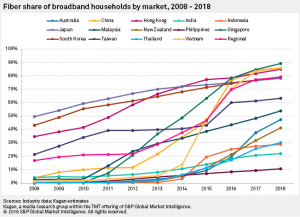 The S&P Global Market Intelligence research group found that as of the first half of 2018, 49.3% of fixed broadband households across 14 markets could access these broadband speeds, equating to 248 million homes. China accounted for 188 million of the high-speed connections, followed by Japan’s 35.8 million connections and South Korea’s 17.4 million. These countries were also the top three broadband markets in the region by overall subscriber base. “In nearly all markets, FTTP broadband households have rapidly become more prominent over the past 10 years, thanks to a number of national broadband initiatives that have honoured strategic importance to fibre technologies,” according to the report. However, there were large geographical discrepancies in terms of the percentage of broadband speeds that were 100 Mbps and up. In Singapore the figure was 92.6% as of June 2018, in South Korea 90.9%, Japan 90.0% and in Hong Kong 82.6%. 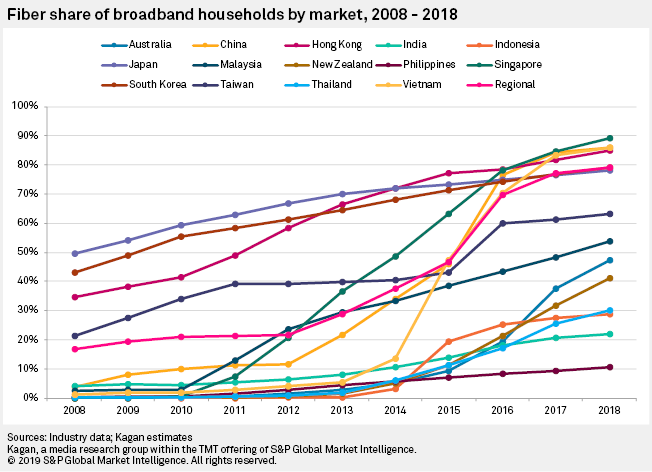 By comparison, the remaining Southeast Asian markets, as well as India, each had less than 5% of broadband households connected to 100 Mbps or above services, with India at the bottom of the list with just 0.6%.